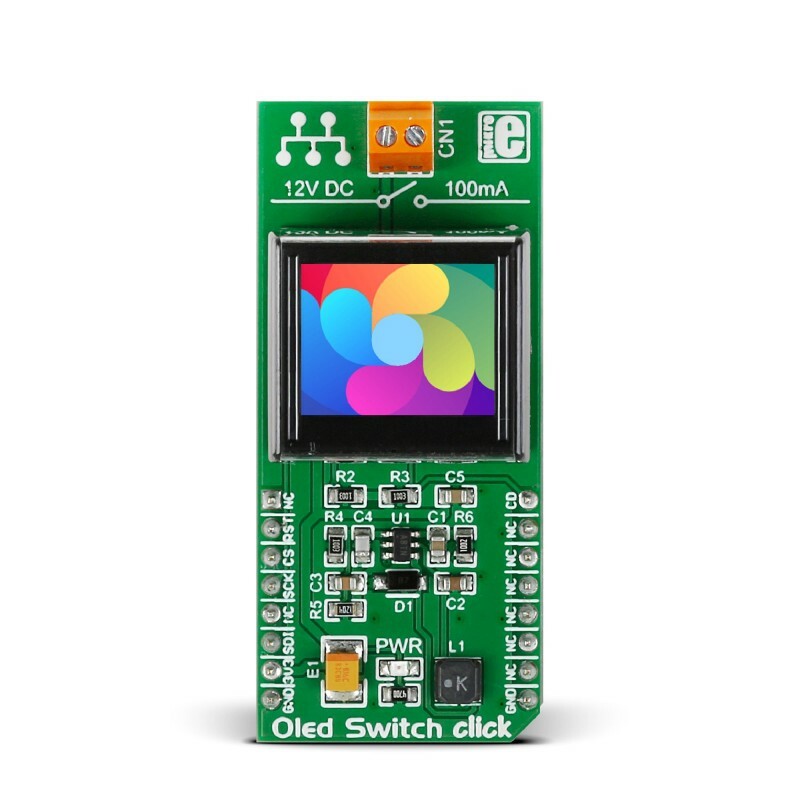 If you are building any type of human machine interface, OLED Switch click can help you keep the design simple, clear and interactive. It can be used in designing a control panel for an industrial machine… or a DIY arcade. This board has a module that combines a button and a full color organic LED display, plus input/output screw terminals for connecting an external circuit (to toggle it on and off). The mechanical button itself is nicely built, with a translucent black housing. When pressed, it gives satisfying tactile feedback. 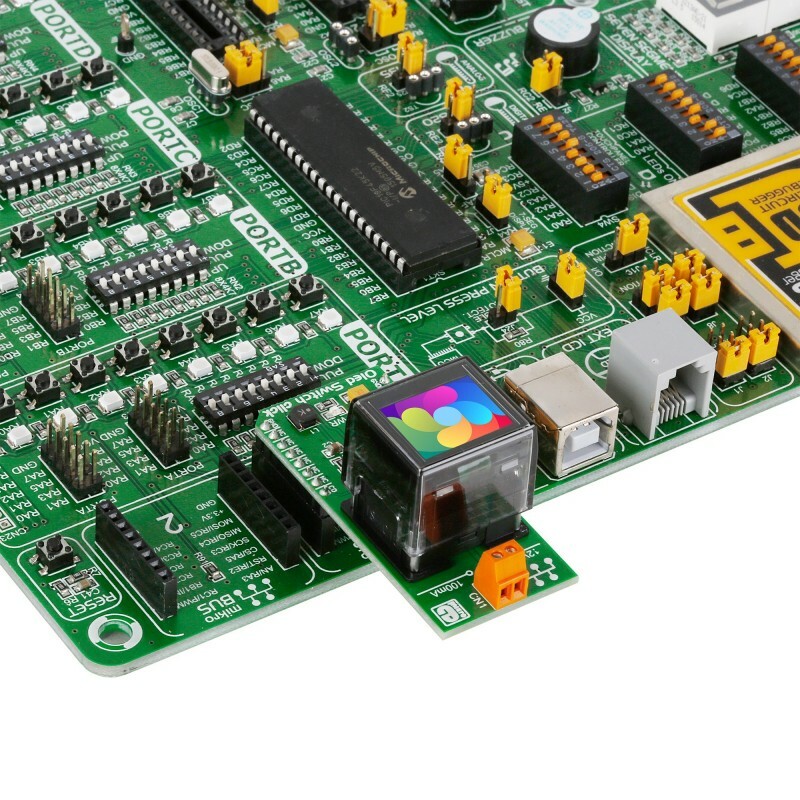 The display, built in the button itself, can show 64 by 48 pixel images with up to 65k colors (16-bit depth). The display is big enough to display simple information, whether as icons or words. Small characters are legible and clear. The most interesting feature is that the display can be programmed to change the picture when needed (for example, you can design a reprogrammable keypad that would allow users to switch from latin to cyrillic script or to chinese characters). VisualTFT can be used to prepare the bmp images. There is a learn.mikroe.com article that explains how to to take 16 or 24 bit bmp pictures and create C arrays. The article is about RGB matrices but the same principle applies. 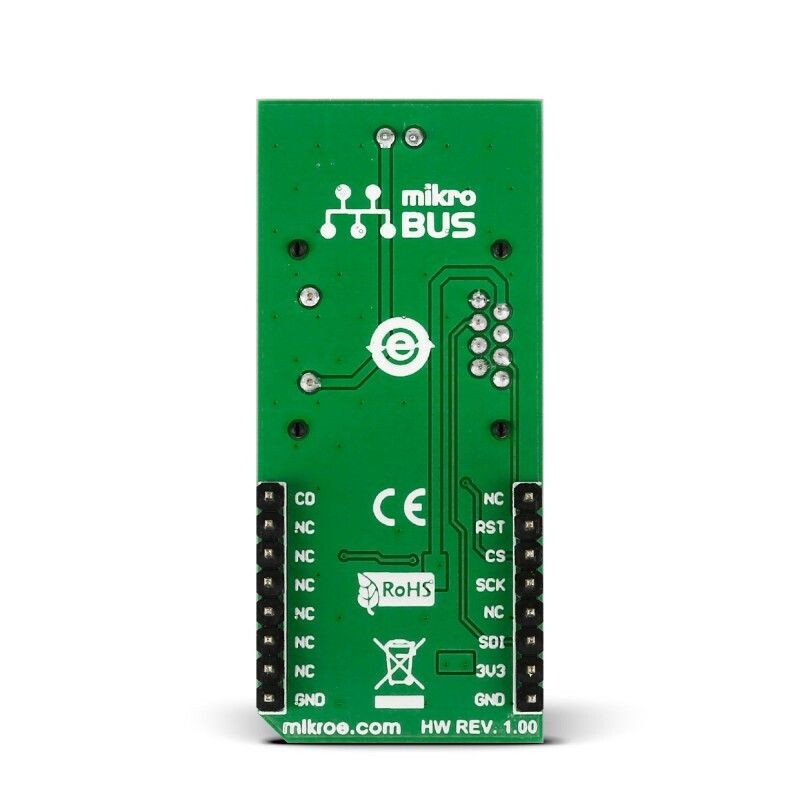 The board communicates with the target MCU through the mikroBUS™ SPI interface. It uses a 3.3V power supply only. 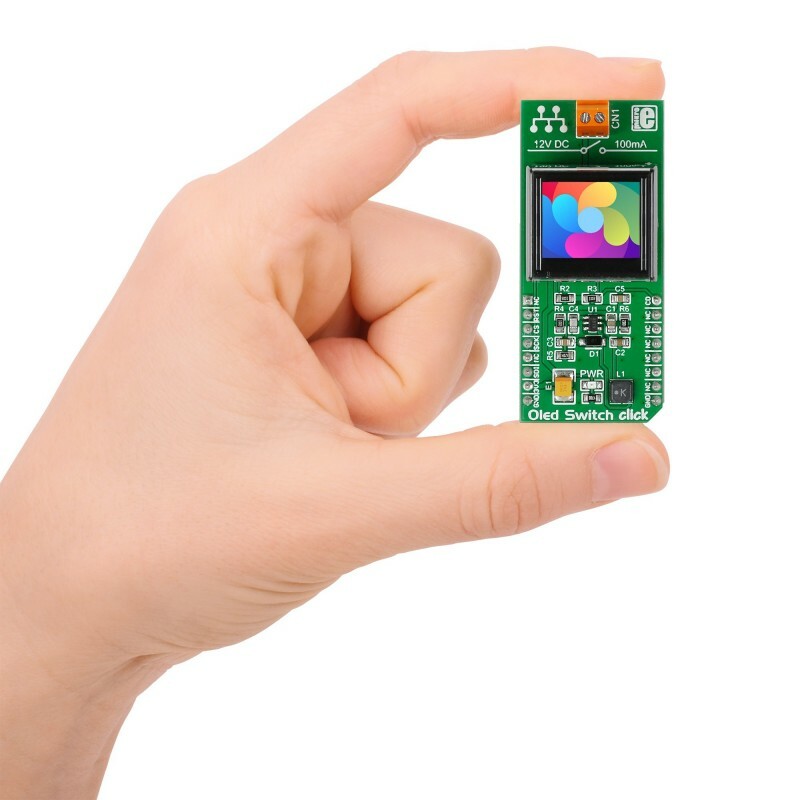 This board has a module that combines a button and a full color organic LED display, plus input/output screw terminals for connecting external electronics. With the screw terminals, you can toggle an external circuit on and off. The internal frame buffer on the OLED display holds 96x64 pixels with 2 bytes of 565 formatted color information for each. When displaying an image the size of the display, (64x48) the image will be displayed well, unless scrolled. To scroll an image without having random pixels from unused space in the internal frame buffer, load a 96x64 image onto the OLED Switch click with your desired image centered like the blue colored area in the picture below. This code snippet takes a 565 formatted 16-bit bitmap and displays it on the OLED display, and then scrolls the image across the display. Code examples for OLED Switch click, written for MikroElektronika hardware and compilers are available on Libstock.